One of the things that I'd like this machine to do is be able to travel longish distances, carry some luggage, and possibly combine this with some overnight camping. I have long had a hankering for some bike-packing and this might be the time to try and get some action. 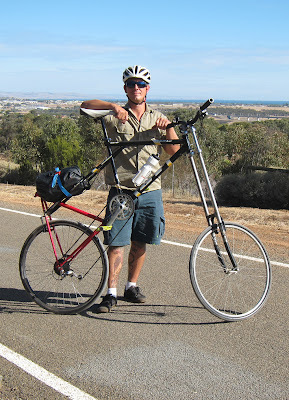 There are a bunch of great blogs about people's cycle touring escapades which become portraits of the riders as well as documents of adventures and I'll post more about that in the future. This first outing was one that needed to test the ability of the bike to be ridden for a few hours at a time over varying terrain, with a small amount of luggage. For this journey I chose to ride from where I live in Adelaide, Underdale, south to Seaford, travelling predominantly along the bike path which follows the Southern Expressway. The trip is a couple of hours long at a casual pace, with one particularly steep hill, after which the ride yields some lovely views of the Fleurieu Peninsula and the ocean. Shortly after this happy snap I ran over some broken glass at high speed (I think it was an old television that someone had generously smashed on the bike path), resulting in a rapid halt and a majorly severed sidewall on my front tyre. Often this sort of incident is the kind of thing that can put you out of action for the day as once a repaired tube has been inserted, the inflated pressure can bulge it out of the cut in the tyre, producing another puncture. Fortunately, as Australians, a happy little fix that can be performed in this situation is the insertion of one of our lovely plastic banknotes. 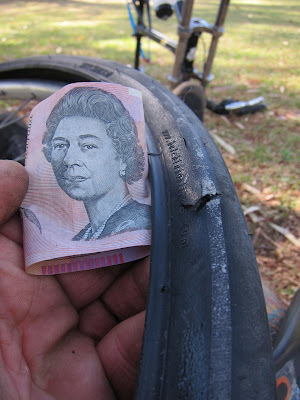 The notes are very strong and support the pressure, inside the tyre, allowing the rider to continue on their merry way. This presented me with a lovely portrait of Queen Elizabeth - thanks Lizzy! I arrived at my destination, an event celebrating artworks made with tarps, held on the Seaford beach. The guys from TARPSPACE hosted a lovely afternoon, with some extra special outdoor artworks from a range of artists. I used James Marshall's construction as a launching ramp to practice my TALL BIKE BACKFLIPS.